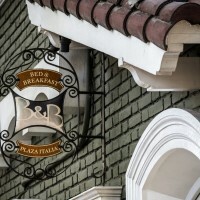 Several reasons define Bed and Breakfast Plaza Italia as an excellent accomodation in Mendoza. A major reason is its SUPERB LOCATION. It is ideal to discover the best of the city, just walking. No need to spend time and money in taking a taxi or a bus. Not necessary to rent a car or to look for parking. B&B Plaza Italia is situated in a privileged location in Mendoza, an area of elegant private residences, across the street from Italy Square (Plaza Italia) and close from Plaza Independencia (Independence Square), “a must for tourists”, with more than 50 stands of artisans, antique dealers, saddlers, jugglers, clowns, living statues and street musicians. In its environs you can find most of the best hotels, the Regency Casino (inside the Park Hyatt Hotel Mendoza), the Convention and Exhibition Centre, Theatre, Museums, Sarmiento walkway, the best ice cream shops (Gelato Style), the fanciest wine bars, nightclubs, bars and pubs and most of the best restaurants offering the famous grilled meat of Argentina. All this in an area of 500 meters, where you can also find the two most important shopping streets of the city. Travel and tour agencies, money exchange and the banking district with many A.T.M.´s. Pharmacies and supermarkets, laundry, bike rental and the best wine shops are literally around the corner. Aristides Villanueva Avenue, just four blocks from B&B Plaza Italia, is the heart of night life in Mendoza, with its endless array of bars and pubs, where you can enjoy your happy hours, eat traditional foods, enjoy artisan beer, listen to live music and dance until late at night. 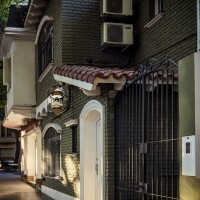 If you walk just two blocks from B&BPlaza Italia towards the north you will find Sarmiento Avenue and several restaurants, including Azafran, La Lucia, Estancia La Florencia, around the block from Maria Antonieta. Fuente y Fonda is just next door. Furthermore, you can easily walk from B&B Plaza Italia to the gorgeous Emilio Civit avenue and find the Sushi Club, the best ice cream of Mendoza at Soppelssa or Perin, or pause for coffee in Via Civit and Kato Cafe. Continue walking up the street towards the amazing General San Martin Park, beautifully designed by a famous French landscaping designer called Charles Thays, who also designed the woods in Palermo, Buenos Aires. Once you are in the Park, we recommend to take a walk around the lake and see the rose garden, to climb the Cerro de la Gloria (Glory Hill) and to visit the City Zoo, located on one of its slopes. Walking towards the South, just two blocks from the B&B, you find Avenida Colon (Colombus Avenue) with its shops, cafes and the Irish Pub. A few blocks away, heading East, you can find the charming Plaza España (Spain Square). 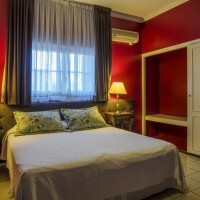 When you choose B&B Plaza Italia as your place in Mendoza, you make sure that you have most of the city at reach, doing nothing but walking, without spending extra money on taxis or parking, and within one of the safest areas of Mendoza.